***image1***The gifted mind of Malik Zulu Shabazz immediately went to work upon accepting the invitation by the Honorable Minister Louis Farrakhan to be a co-convener of the 10 Anniversary of the Million Man MarchTM. Sixteen years of activism and community involvement laid the foundation for his current tour of town hall meetings and rallies to mobilize support for the March. The bookworm boy, greatly influenced by his grandfather who was a member of the Nation of Islam since 1955, grew up to graduate from Howard University Law School in 1995, and inherit the leadership mantle of the New Black Panther Party for Self-Defense (NBPP), now serving as its national chairman. During his recent visit to Chicago to attend Saviours’ Day with the Nation of Islam, the revolutionary attorney sat down with Final Call Online Correspondent Ashahed Muhammad for a wide-ranging topical discussion on past leadership, activism, the movement for reparations and his role in the upcoming 10th Anniversary of the Million Man MarchTM. Ashahed Muhammad (AM): Recently, Minister Farrakhan publicly announced that he had asked you to join in as one of the co-conveners for the 10th anniversary of the Million Man MarchTM. Can you describe your feelings about having the opportunity to serve in such an important position of leadership and highly visible role? Malik Shabazz (MS): I am deeply honored and humbled to have been asked by the Honorable Minister Louis Farrakhan to be a co-convener of the Million Man MarchTM 10-year anniversary. As he told me, it is because, in the 1960s, the Black Panther Party rejected the offer of the Honorable Elijah Muhammad of an umbrella from the Nation of Islam to be placed over the Black Panthers. For us to now beat history and reverse that, and for the New Black Panther Party to work under the call of Minister Louis Farrakhan for a Million Man MarchTM, is significant and historic. AM: Some journalists are now trying to say, “These are not like the old Black Panthers,” as if they were actually the friends of the Black Panthers of the ’60s, to try to discredit you and those who are with you. Will you speak about that? MS: Today, they are upset with us because we have aligned ourselves with the Nation of Islam and because one of the great warriors and helpers of the Nation of Islam, Dr. Khallid Abdul Muhammad, was the former National Chairman of the New Black Panther Party. So, in that sense, in this present time, the Nation of Islam has given birth to the New Black Panther Party on a national level, because there was only one or two chapters of the New Black Panther Party until Dr. Khallid Abdul Muhammad was appointed the National Chairman in 1998 and spread the New Black Panther Party into now, over 40 cities including London, England and into Germany. So, we today are happy to be involved in a African United Front. We are happy today to be standing side by side with the Nation of Islam. We believe, like the Nation of Islam and the Honorable Elijah Muhammad believe, in a nation of our own. We believe in a Black first philosophy and a Black Liberation Theology. We don’t worry about the criticism. We love all of those who labored in the Panther Party from the ’60s. Many are with us today. They see us growing and conducting free food programs, free clothing programs, giving away school supplies in the Black community. They see us conducting town hall meetings, rallies or demonstrations or organizing against the injustices our people face and they’re starting to take another look at us and understand that the New Black Panther Party is for real, and we are sincere, dedicated servants for our people. AM: Much has been said regarding your mentor Brother and Dr. Khallid Abdul Muhammad’s split with his teacher, the Honorable Minister Louis Farra-khan. In the current edition of The New Black Panther newspaper, it’s apparent that you felt the need to clarify what may have been a misunderstood position, regarding the events that transpired during that time. Can you go into details about that? MS: I want to let the Muslims know that Khallid Abdul Muhammad left this earth a Believer in Master Fard Muhammad, a Believer in the Honorable Elijah Muhammad and a Believer and in love with Minister Louis Farrakhan. Even though he became the chairman of the New Black Panther Party, that is not a bad thing, if you understand the divine conclusion in this. If he had not become the national chairman of the New Black Panther Party, there would be no New Black Panther Party. Many in our organization, for one reason or another, would not have joined or made it in the Nation. So, don’t look at it negatively, members of the Nation of Islam, look at it in its divine and positive sense. Whatever happened between Brother Khallid Abdul Muhammad and his teacher has resulted now in the Nation of Islam giving a rebirth to Black nationalism; and giving members of the Crips, Bloods, El Rukhns, Vice Lords, men out of prison, college students, young people, Nationalists, and others who would never join the Nation a home in the New Black Panther Party. And now, Minister Farrakhan, in his graciousness, has brought us all back together again. So, I would ask that the members of the Nation of Islam always honor Minister Khallid Abdul Muhammad for standing with Minister Louis Farrakhan in the late 1970s, in the early ’80s when there was no F.O.I., when there was no one to defend Minister Farrakhan. Let us focus on the positives, not the negatives. AM: Towards the end, Brother Khallid made some unflattering comments about the Honorable Minister Louis Farrakhan and the Nation of Islam and I think that it’s important, as I read in your newspaper, to clarify that, because you said that you weren’t with Brother Khallid to go against Minister Farrakhan. MS: That is absolutely true. I never followed Dr. Khallid Abdul Muhammad to be an opponent of Minister Louis Farrakhan, only to be an opponent of the enemy of Black people. I want everyone to understand that, whatever went on yesterday, we are in the process of healing it today. I can’t answer every aspect of the controversy of two wise men who are both beyond me, but I can today be accountable for my own leadership. I have expressed to the New Black Panther Party my love for the Honorable Minister Louis Farrakhan, who is my Imam, my Pastor. All of the members of the New Black Panther Party love Minister Farrakhan. When Khallid Abdul Muhammad was here, he would send us to hear Minister Farrakhan. If Dr. Khallid had a few more days or years, I believe there would have been a divine reconciliation between those two men. It did not happen yesterday, but it is happening today between his students in the New Black Panther Party and the Nation of Islam. So, again, let us focus and try to look at the good that Minister Khallid Abdul Muhammad did, because if you heard him make some comments that you did not agree with, you probably don’t understand the depth and complexities of what was going on between those two men. You have to leave it to Allah, Minister Farrakhan and the ancestral spirit of Khallid Abdul Muhammad. AM: What do you really think will come out of the movement for Reparations? MS: It’s hard to judge that an enemy who has really never done justice to Black people will go in his treasury and accounts and turn over to Black people what is rightfully due us. But this does not mean we should not struggle around the principle for reparations. Ultimately, whether the White man or the United States government give Black people reparations, we must fight for reparations. We must demand reparations, but we must go after, as the Honorable Elijah Muhammad teaches us, some of this good earth, some of this land that we can call our own. So, I don’t know whether this enemy will actually give us reparations, but I know that we must put as much pressure on him as we can. I believe that we can achieve some positive results and, in the meanwhile, we should go after repairing ourselves on a daily basis. AM: As an attorney who is respected in your field and received awards from your peers regarding your quality of legal aid, assistance and activism, talk to us about the plight of political prisoners. MS: The two cases I would have to bring up right now are Imam Jamil Al-Amin and Dr. Malachi York. I’m working on the appeal of Dr. Malachi York, the former leader of the Ansar Allah community in Brooklyn or the Nuwabian Nation. Dr. York has received a sentence of 1,620 years on alleged charges of child molestation and other tax evasion charges. But the trial was a trumped up trial. It is currently on appeal, I’m assisting on the appeal and we expect Dr. York to be victorious on his appeal. I would ask those who read this interview to support the case of Dr. Malachi York, even if we may disagree with some things that Dr. Malachi York has written. He has a following around the world and he deserves our support. Imam Jamil Al-Amin’s case is tougher, but we must support him, because he has given us so much and fought for us on the frontlines. We cannot let him just languish in jail. I would also like to advocate for the cause of Mumia Abu Jamal, of course, as well as the cause of Dr. Mutulu Shakur, Brother Sekou Odinga, Sundiata Acoli, Brother Mufundi Lake and all of our other political prisoners who have fought for us. Many are being persecuted behind bars. Many don’t ever receive a letter or words of inspiration from us. So, in our paper, we always have a page for the political prisoners with their information and their addresses. As an attorney, I am fighting as many cases as I can, but I want to ask all of the other attorneys who will read this article to take some time out of your work to give back to those who helped us get where we are. AM: There were protests and a power outage during your recent appearance at Carnegie Mellon University. What happened? MS: The transcripts of my speech will be printed in the next edition of The New Black Panther newspaper. There was intense opposition by Abraham Foxman, the Anti-Defamation League and the Jewish student group Hillel, to my coming to Carnegie Mellon University. I didn’t come to speak to them or really even to talk about them. I came to talk to the Black students on my standard subject, which is the role and responsibility of the Black college student. But the Jewish students cut my honorarium, the Anti-Defamation League went on the airways and it was all in the media, trying to stop us from coming. We still came for free, because I am a freedom fighter. I will come for free; I’m not a mercenary. It was overwhelmingly successful, even though the enemy pulled the lights during the lecture. We had security from the New Black Panther Party and Muhammad’s Mosque No. 22 in Pittsburgh, and we kept teaching in the dark. The students were happy, and we went to work with all of our books and facts and we won the students over. The enemies and Zionists in the audience were all sat down. We have to fight on the college campuses. The ADL, in a very sophisticated and strategic manner, has gone to these presidents, student groups and student activities directors and blocked the message of the Nation of Islam, blocked the message of the Black Revolution from getting to the college students. We must take to these campuses and fight to get students back, because if we don’t, we’re going to lose a generation of very powerful young people that are just going to be swallowed up into White corporate America. So, the college campuses are battleground today that we must fight, fight, fight on. 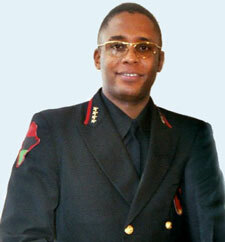 AM: On Feb. 14, the ADL asked Russell Simmons to denounce Minister Farrakhan. Let’s get into that a little bit as well as the state of hip hop. MS: Why would Abraham Foxman want to separate Russell Simmons from Minister Farrakhan? Because they know if the rappers get a revolutionary message, that if the rappers start to clean up their act and rap revolutionary rap, the game is over. The enemy, and those who control the distribution of rap, shut down revolutionary rap and would only fund gangster rap after [the 1992 L.A. rebellion against police brutality.] We saw an extreme rise in gangster rap and the elimination of revolutionary rap. Today, it seems like we’re coming back again because, in his brilliance, Minister Farrakhan has established a relationship with Russell Simmons and other rappers. I say to Brother Russell Simmons and the other rappers: Don’t let them make you believe that they have more power than you. It is they that need us and we have to eventually get rid of all of them as our distributors. We must be free of them. The pressure will increase around this Million Man MarchTM, so stand strong against the lies of old Abraham Foxman. AM: When White people see Black men with guns, their ideas on gun control automatically change. They believe in the right to bear arms until they see Black men asserting that right. That’s perhaps the most controversial characteristic of the Black Panthers that I think everyone is aware of and perhaps the most misunderstood. MS: The New Black Panther Party stands firm on our rights for self-defense, but we are very responsible in asserting our rights for self-defense. We believe in our God, first. We don’t believe necessarily that power comes out of the barrel of a gun. That power comes from the Lord of the Worlds, Almighty God, Allah. But we do believe that, after what we have been through in this country, we would be naïve not to be able to protect ourselves, families and where we live in a manner of self-defense. You don’t necessarily see the New Black Panther Party walking out here on the street with guns. We don’t encourage our members to get illegal weapons and ride around with them in cars and carry them around everywhere, because we know that this is what the devil wants us to do. He wants to set us up, by having illegal weapons in our cars or pockets. We say obey all laws that don’t conflict with our religion and the law of the United States. According to the Second Amendment and depending on what jurisdiction you’re in, you are allowed to register a firearm. In certain states, like Texas, they allow us to carry our guns openly, and at different times we do. Where we are allowed to register a firearm in our home, we do. But we must make it clear that the interest of the New Black Panther Party is not on the gun. The emphasis today of the New Black Panther Party is building an organization that can reach and rescue Black youth, and aid our community. We are not deviating from our assignment to be able to defend ourselves, but our focus is on our God and organization, but we are not going to allow this enemy to believe that he will get away with running rampant and wholesale with his police brutality in the Black community and that somebody is not going to have an answer for them, somewhere. If you’re going to have a gun, which we don’t say you have to have, how about defending your community and making it safe for the elders and mothers? If we have guns, it’s a deep responsibility that we take very carefully and cautiously. Look at our history since 1989. You haven’t seen us getting shot up and killed. You haven’t seen the police raiding our buildings and shooting us up. You haven’t seen us out here saying, “Free Hashim, Free Rahim!” It is not because we are weak, it is because we’re wise; and even though the Honorable Elijah Muhammad teaches against carrying weapons, we still take pages of wisdom from the Honorable Elijah Muhammad and operate in a way to keep this devil away from us. AM: Do you claim to represent the legacy of the Black Panther Party of the ’60s? MS: Yes. You must remember that I just inherited this leadership of Dr. Khallid and there were others who’ve had this organization since 1989. It is true, we are the Black Panther Party resurrected, but we are dedicated to scientifically correcting and eliminating the mistakes that the Panthers made in the past and accentuating that which is needed in the present. They didn’t believe, necessarily, in a Divine Theology. The New Black Panther Party believes in a Black Liberation Theology. The New Black Panther Party believes in the Theology of the Honorable Elijah Muhammad. We believe in spiritual values, which is giving us humility, where we’re not doing our own will; we firmly believe that we’re doing God’s Will. You’re not going to be out here cheating, stealing and getting in trouble, when you put God first, as this New Black Panther Party is doing. We believe in moving with Divine Protection. AM: What would the perfect world of the New Black Panther Party look like? MS: The perfect world for us would be the vision of the Honorable Marcus Mosiah Garvey and the vision of the Honorable Elijah Muhammad and even according to the 10-point program of the Panthers from the ’60s. Our perfect world, of course, is a nation of our own. We want our own land, factories and farms. We are tired of demonstrating against police brutality year after year, month after month, “Please treat us right. Stop discriminating against us.” It seems almost impossible to achieve real justice within the confines of White racist America. So, the perfect world, of course, is a Black nation. The perfect world for us would be the Honorable Louis Farrakhan as our president and a Congress with our best politicians, scholars, researchers, thinkers and activists working under a divine chain of command. Now, let’s talk about idealism verses realism. Until we can achieve a separate land and territory of our own, a perfect situation for us is developing, right now, our unity with the Nation of Islam, other Black leaders, thinkers and organizations. October 16, 2005 to us will be a little bit more than a glimpse of heaven. It will be a reality of a heaven coming into existence, because we know today that the New Black Panther Party stands with a man that we call a Leader amongst leaders. He has the capacity to bring all of us together and all we want to do is help him. All I want to do is to help him manage the immense talent that respects him. So, he is really the man today who can help make the perfect situation. He is the man today who can help bring that glimpse of heaven and make it a reality. We want to say to the Nation of Islam, whenever you need us—we know you have the security situation handled—but if ever you need us in any way, we are right there at your side. I will be going in the highways, the byways, on college campuses preaching that which has been in my heart for years. Even though I went through the split with Minister Khallid Abdul Muhammad, I have always had love for that man that woke me up on my college campus, Minister Farrakhan. I will always have love for that man that taught me Islam and helped make me into what I am and helped make these young men into what they are becoming. We want to help Minister Farrakhan achieve his vision and we’re humble that he has been gracious and kind enough and felt a need to work with us. If the Black Nationalists, Muslims, religious community, gang community and rap community come together as one and put a liberation plan into effect, determine we will work every day after October 16 for our complete liberation and work on establishing the business, educational and cultural aspects in the community that we need, if we all work, work, work, work in this unique opportunity for this Million Man MarchTM 10-year anniversary and the plan thereafter, we will see what we desire coming into a manifest reality.